There were seven Video Reviews this week and in all cases, the referee changed the decision that had been made on the field. We have analyzed each of these reviews and explain why there was no review for D.C. United’s second goal in Orlando. With the game still scoreless during the early stages, a goal was scored through a deflected shot by TFC’s Justin Morrow. The VAR checked the goal, including the Attacking Phase of Play (APP), which revealed that Nick DeLeon (TFC) was in an offside position when the ball was played to him by Marky Delgado, prior to DeLeon’s cross into the NYC penalty area which ultimately led to the goal being scored. Even though Maxime Chanot (NYC) cleared the first cross from DeLeon and later Anton Tinnerholm (NYC) also partially cleared Morrow’s crossed header this does not reset the APP. For the APP to reset Video Review Protocol requires that the opposing team have clearly gained possession. In the very early stages of the game, a goal was scored by Gerso Fernandes (SKC) and awarded by the on-field match officials. The goal was checked by the VAR and in doing so she could see that Fernandes was in an offside position when the ball was headed to him by teammate Krisztian Nemeth. The referee correctly disallowed the goal for offside. It later became apparent that the assistant referee wrongly held the belief that the ball had been headed by a defender to Fernandes, and not by Nemeth. The was an excellent use of the Video Review system to correct a clear and obvious error by the on-field officials. What Happened: As a cross came into the Toronto FC penalty area, Alexander Callens (NYC) grabbed the shirt of Jozy Altidore (TFC), thereby preventing Altidore from jumping for the ball. The holding offense was clear; however, it was missed by the referee who was not well-positioned to see it. Whenever an attacker goes down in the penalty area the VAR will check the footage. 7 seconds: The VAR asked the referee to delay the goal kick because he had spotted the grabbing of the shirt and needed more time to take a better look. 10 to 30 seconds: Having identified the High EZ and Game camera as two angles that clearly showed the shirt being grabbed and stretched, the VAR recommended a review. 59 seconds: The VAR showed a zoomed in view of High EZ in real time speed first and then a slow-motion view from the Game camera which showed the start of the holding to the end. 1:23: The referee said, “it’s a penalty” and left the RRA. PRO’s Decision: The grabbing of the shirt was clear (outstretched and not negligible) and prevented Altidore from being able to play the ball and as such, is a penalty kick. This was a good use of Video Review. What Happened: With the score at 1-0 to New England Revolution midway through the first half, Michael Mancienne (NER) challenged Angelo Rodriguez (MIN) for the ball within the NER penalty area. As the two players came together and the ball bounced up in front of them, Mancienne’s left arm moved forward towards the ball and his hand knocked the ball away. The VAR spotted a possible handball in the penalty area and began the checking process while play continued. 10 seconds: Having seen one angle that appeared to show the handball, he informed the referee, “checking, checking” to alert him that there may be a review coming and to delay any restart. 22 seconds: He confirmed that the ball has been played by the hand, but wanted to make sure that it is a handling offense, so he asked to see it again at 100 percent speed.
. The referee saw the footage once in real speed and twice at 50 percent. PRO’s Decision: The VAR needed to try to stop the match as soon as possible once they decided to recommend a review and since MIN had possession in a neutral zone at that moment, he was correct to ask the referee to stop it when he did. On seeing Mancienne’s actions on the replays, this is a clear case of the arm moving towards the ball in what was an unnatural action. This was a good use of Video Review to reach a very credible outcome for what was an unorthodox action by the player. What Happened: With the score at 0-0 in the final minute of time allowed for stoppages at the end of the game, a shot on goal by Hwang In-Beom (VAN) was blocked by Kim Ki-Hee (SEA). The ball rebounded off Kim to safety but the momentum of his blocking action carried him into Hwang. The Video Review Process: This review took more time than usual due to some difficulty communicating with the referee. The VAR was not sure what the on-field decision was and the referee was dealing with the players. In Vancouver, the Video Operations Room is situated in the tunnel near the locker rooms and the VAR does not have a view of the field so they cannot always be sure what the on-field decision is without communicating with the referee. 60 seconds: VAR began to check to see if there is a clear error in the giving of the penalty kick. 2:20: The VAR recommended a review and showed the referee the angles from Right End zone and Right 18. 4:00: The referee made the second signal and restarted with a drop ball and not a throw-in since the ball was still in play when he called the original penalty kick. PRO’s Decision: The referee incorrectly judged this normal contact to be a foul and having seen the footage in the RRA he correctly canceled the penalty and re-started the game with a drop ball. This was a good use of Video Review although it took longer than usual. The VAR saw the Feilhaber tackle live and took a quick second look at his quad screen. 7 seconds: He asked the referee to delay the restart as his initial reaction is that this could be a red card and he needed more time to check. 35 seconds: After having looked at the footage twice at full speed and once at 50 percent (Tight) he saw that Feilhaber came into the back of Martinez and as he did so he raised his left arm, which was cocked at the elbow, and thrust the forearm into the back of Martinez’s head. He recommended a review for a possible red card for contact to the head. 40 seconds: The referee responded that he has not seen any contact to the head and made his way to the RRA. 50 seconds: The referee watched Tight angle twice at 50 percent and felt that there was not enough force and so made a judgment that the actions of Feilhaber were reckless, falling short of violent conduct. He decided that he would caution Feilhaber for the challenge which is still within Video Review protocol. PRO’s Decision: There is some subjectivity about the amount of force used, and whether it was excessive. However, due to the nature of the action and the point of contact to the head, PRO felt this was worthy of a red card and was an appropriate Video Review recommendation. A red card should have been shown. Starting Point – On Field Decision: Foul – Yellow card given (originally incorrectly to Axel Sjoberg but corrected to Tommy Smith without Video Review). 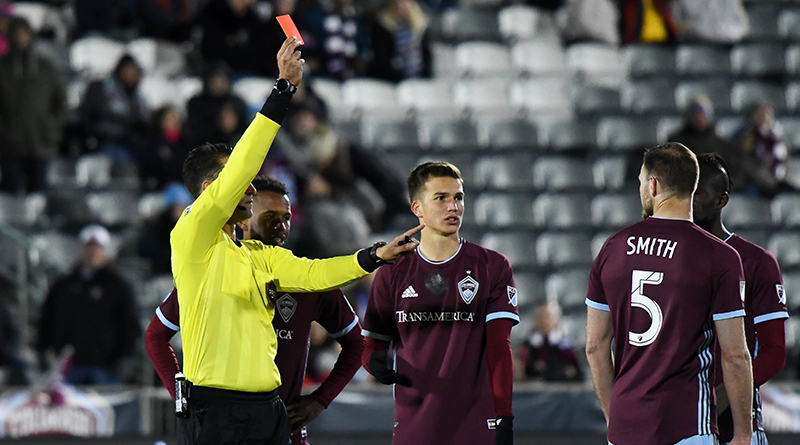 What Happened: In the closing stages of the game, Colorado Rapids were attacking the Houston Dynamo goal. The ball was cleared by AJ DeLaGarza (HOU) from within his own penalty area but as he did so Smith (COL) made a late, lunging, off-the-ground with feet first challenge towards him. The studs of Smith’s right boot made contact with the left shin of DeLaGarza before Smith’s left foot also came through. There was excessive force used in the tackle and the incident sparked a confrontation between the players. The referee calmed things down before cautioning Smith for what he initially judged to be a reckless foul challenge. The VAR immediately began to check the tackle, while the AVAR continued to monitor the mass confrontation and what was happening live. 35 seconds: The VAR is ready to recommend a review for the Smith tackle, however, he is waiting for the referee to complete giving the misconduct on the field. He has to wait for the on-field decision to be completed before he can recommend a review. 1:55: The VAR recommended a review. 2:25: The referee is shown the Right 18 footage once for point of contact and a second time to see force. PRO’s Decision: This late, lunging tackle with a point of contact above the ankle is serious foul play. This was a good use of Video Review and although the on-field process of issuing the cautions was less than efficient the correct outcome was achieved. ORL vs DC: Why no Review? What Happened: With the score at 1-0 to D.C. United, a free-kick was awarded for a foul challenge by Dom Dwyer (ORL) on Wayne Rooney (DC) near to the corner flag in the Orlando City half of the field of play. From the free-kick, Rooney scored directly. The VAR cannot get involved with the original foul decision because it is outside protocol as it is neither a red card or a penalty kick. Even though replays show there was no contact from Dwyer on Rooney, they also clearly show that Dwyer swings his right leg at Rooney, who has to take evasive action, causing him to stumble and lose possession of the ball. Without the actions of Dwyer, Rooney would have retained possession of the ball. The Laws of the Game state that a player who attempts to trip or kick an opponent will be penalized with the award of a direct free-kick and that certainly applies here. As such, the decision on the field of play was appropriate. The VAR immediately begins to check the validity of the goal. He started at the beginning of the Attacking Phase of Play. 4 seconds: The VAR found the kick point and checked to see if any attackers were in an offside position, he saw none and let the footage roll until the ball is in the net at full speed. 14 seconds: He goes back and takes a second look just to make sure no one was offside. 25 seconds: He began to look at the contact between Frederic Brillant (DC) and goalkeeper Brian Rowe (ORL) and noted that the ball is well out of reach of the goalkeeper. 45 seconds: Having noticed that the referee was dealing with several players from Orlando the VAR asked what they were inquiring about. The fourth official responded that they are arguing about contact with the goalkeeper. 1:30: The VAR took another look at it and again noted that there is some contact, but it was not a foul and the ball is well out of reach, and already gone before the contact. 1:45: He told the referee his check was complete and the goal confirmed. PRO’s Decision: Video Review is not meant for clear and obviously correct decisions. If the referee was to go the monitor for every decision that falls under protocol they would be going to the monitor five or six times per match – the approximate average of incidents per match. The VAR is there to only recommend reviews when in their opinion they see a clear error. Rowe and Brillant came together in the goal area. However, the ball was some distance above them both, neither would have been able to reach the ball even if they had not come together, the ball had already passed them when contact was made and that contact was normal and had no effect on either player’s ability to play the ball. This was not a foul and the referee was correct to award the goal.